The origins of the Pamphili family of Rome can be traced to Amanzio, a Carolingian knight who arrived in the city of Gubbio in the 9th century. Certain family members participated in the First Crusade (11th century). In 1461, the brothers Iacopo and Francesco moved to Rome, where they obtained titles as counts of the Holy Roman Emperor. 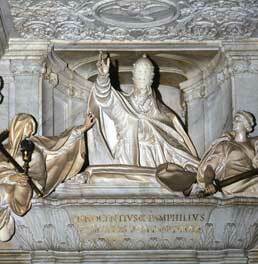 Girolamo Pamphili (1545-1610), a friend and devotee of Philip Neri of Rome, reached the dignity of cardinalship. 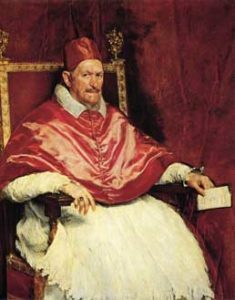 The peak of the Pamphili family power began soon after, in 1644, with the election of Cardinal Giovanni Battista as Pope Innocent X. The pontiff, together with his brother Pamphilio, an able diplomat in the court of the Grand-duke of Tuscany, and his wife Olimpia Maidalchini, immediately proceeded to add lustre to the family name. The son of Pamphilio and Olimpia, Camillo, was appointed cardinal under Innocent X, but eventually renounced his role to marry Olimpia Aldobrandini (1647), the widow of Paolo Borghese. Camillo and Olimpia’s most important child was Benedetto, a friend of the composers Corelli and Handel and himself a cardinal, who continued the Pamphili tradition as promoters and patrons of the arts. The main family line came to an end in 1760 with the death of another cardinal Camillo, the last male heir. In 1671, Anna, daughter of Camillo and Olimpio, had married the wealthy Genoan Giovanni Andrea Doria III Landi, a descendant of the famed admiral Andrea Doria: the assets of the Pamphilis thus went to the ‘Doria-Pamphili Landis’ family.